Definition: The Expansion through Concentration is the first level form of Expansion Grand strategy that involves the investment of resources in the product line, catering to the needs of the identified market with the help of proven and tested technology. Simply, the strategy followed when an organization coincides its resources into one or more of its businesses in the context of customer needs, functions and technology alternatives, either individually or collectively, is called as expansion through concentration. Market penetration strategy: The firm focusing intensely on the existing market with its present product. 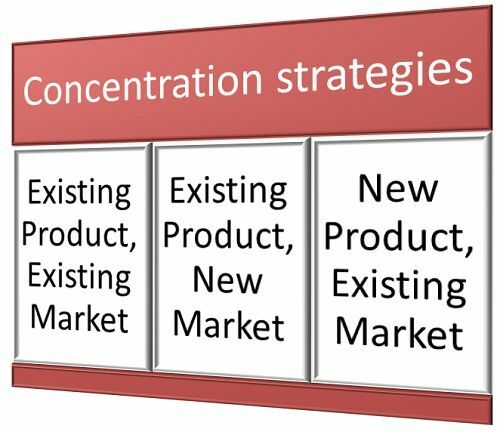 Market Development type of concentration: Attracting new customers for the existing product. Product Development type of Concentration: Introducing new products in the existing market. The firms prefer expansion through concentration because they are required to do things what they are already doing. Due to the familiarity with the industry the firm likes to invest in the known businesses rather than a new one. Also, through concentration strategy, no major changes are made in the organizational structure, and expertise is gained due to an in-depth knowledge about one or more businesses. However, the expansion through concentration is risky since these strategies are highly dependent on the industry, so any adverse conditions in the industry can affect the business drastically. Also, the huge investments made in a particular business may suffer losses due the invention of new technology, market fickleness, and product obsolescence.